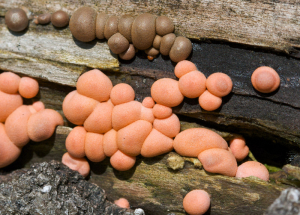 This organism is not a fungus, but rather the fruiting bodies (aethalia) of a Slime Mould. They are made up of masses of single celled, amoeba-like individuals. If damaged when young they excrete a pinkish paste. Once they have matured they will eventually release spores.